I'm off to Orvieto, Italy and then Venice, with my dear husb, returning on June 3. I'm teaching a workshop in Orvieto, then we're traveling with friends to Venice. I've posted a tutorial (below), so you too can practice your sketching & watercolor: journal style. I'll try to post on Facebook, but no guarantees! This drawing and painting took about 40 minutes from start to finish. Set up so you can see your subject clearly and so you don’t need to turn your head from the subject to the page. 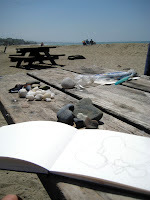 My moleskine watercolor journal is directly in the line of sight of my subject. 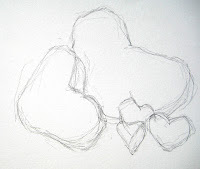 Begin with a very rough, very light pencil sketch. 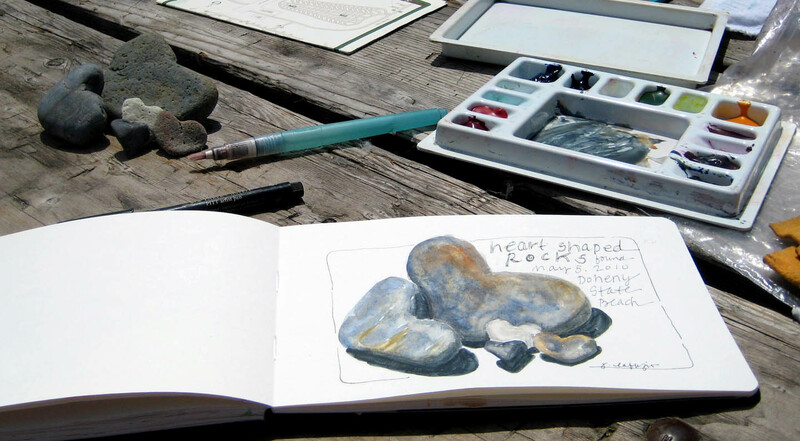 While sketching, figure out where to place the subject on the page, look from rock to rock to gauge the size and relationships. 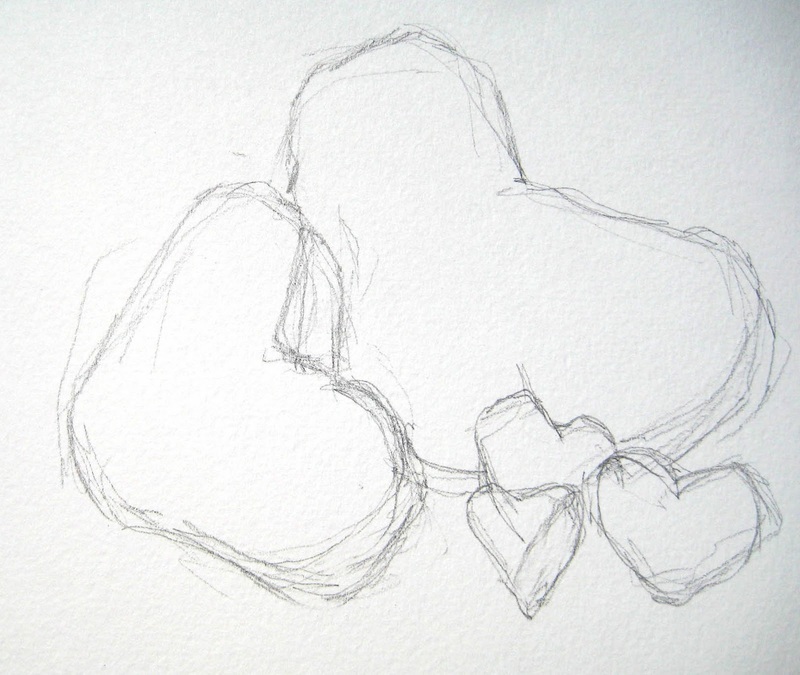 Keep looking at the subject, then to the paper, to the subject until you’ve got the basic shapes and sizes down. 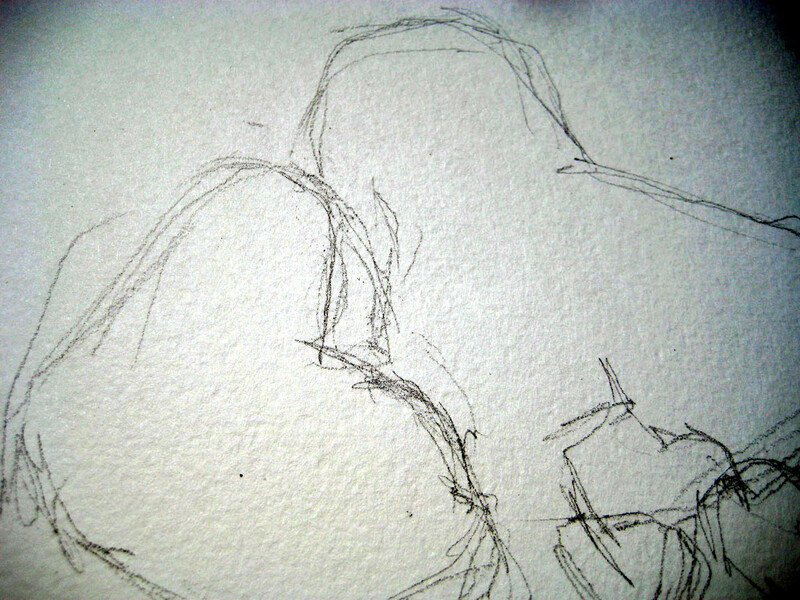 Directly on the rough sketch, begin begin to refine the pencil sketch, correcting and adding details, working shape by shape. 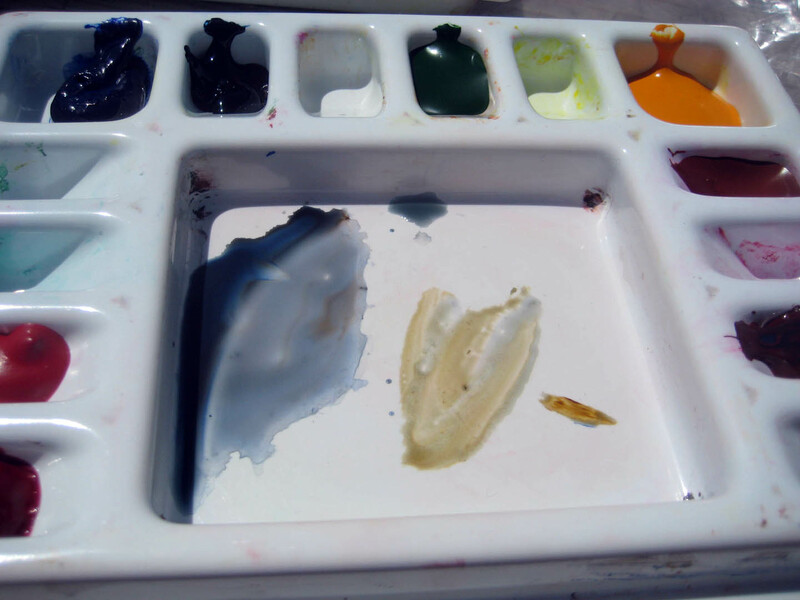 Mix your first color. 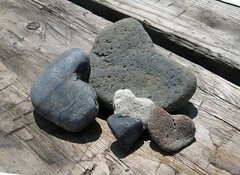 Blue and brown together make a beautiful and wide variety of shades of grey. 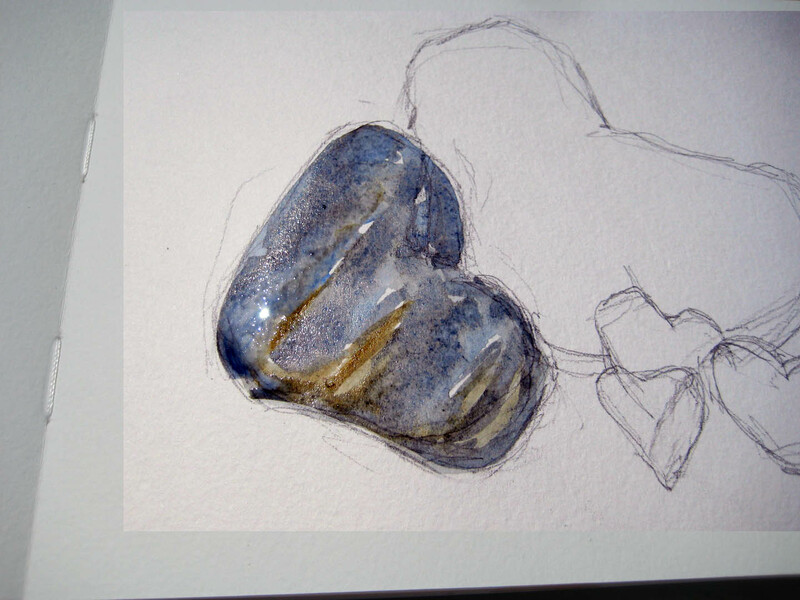 (I’m using Ultramarine Blue and Raw Umber.) 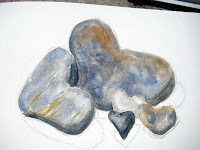 Mix the color in your palette, trying to match as best you can the color of the one of the rocks. Make plenty of color and use water! 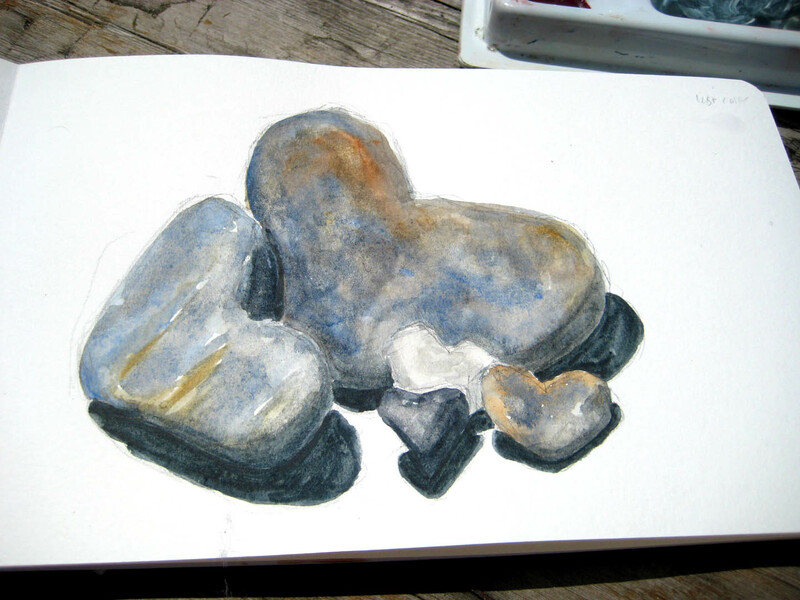 Notice I didn’t just paint the rock a solid grey. I used the color I mixed, plus some of the brown and some of the blue, dropping in the color while the paint was still wet. And, I left some white of the paper. 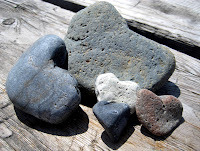 Let the first rock dry, while you move on to the next one. 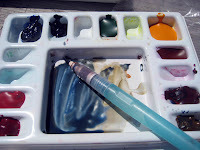 Mix another shade of grey, with the same colors of blue and brown and a little Burnt Sienna. The middle rock was painted with the darkest grey. 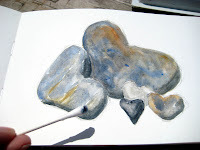 The rock on the right was painted wet-into-wet which means, I painted the rock first with clear water, then, while it was still wet, dropped in my mixed grey, some blue, and some brown and let it blend without touching it with the brush. 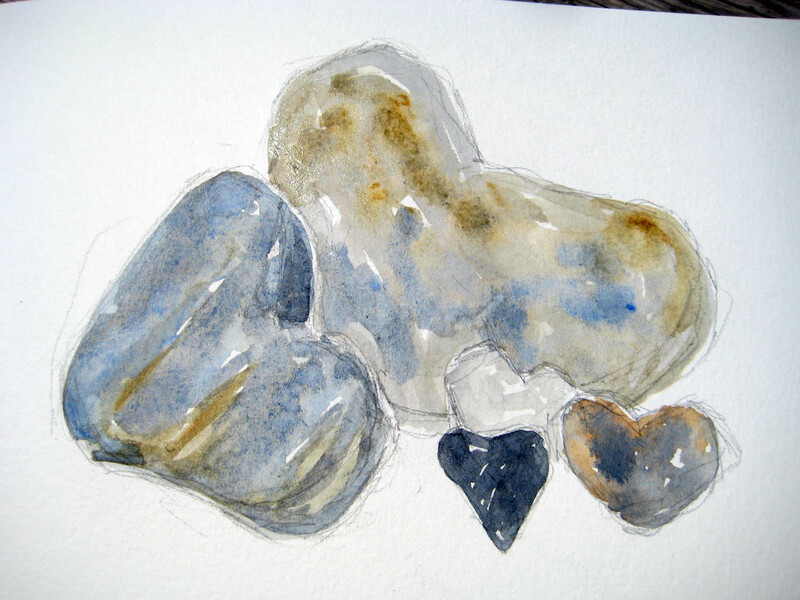 I used the wet-into-wet technique for the larger rock too. I’m still only using 3 colors and varying the shades of grey and dropping in some straight brown or blue. 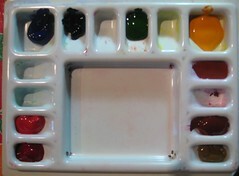 It’s looking a little wimpy, but once it’s dry you can always go in with more color. 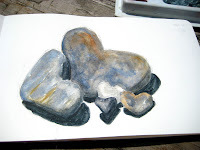 I darkened the larger rock, once it was dry, with a little more paint. I’ve also added the shadows that fall on the rocks, adding volume to them, still only using variations of grey, mixed from blue and brown. I always carry some cotton swabs in my sketch bag . 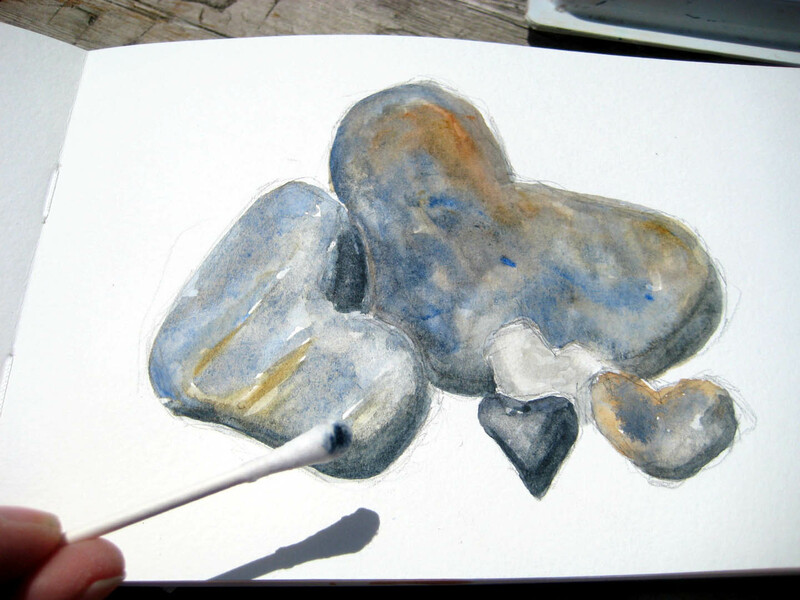 When the paint is dry, I wet the swab with clear water and lift some paint from the rock, creating a light spot, or shine on the rock. Mixing up my darkest grey for the shadows. Shadows! What a difference they make to the realism of the subject. I add a border and text (writing them in pencil first) in permanent ink. Sign my name and date it. Yes, I do love Etsy and probably a little too much. I wanted to share my 3 recent fabulous purchases. 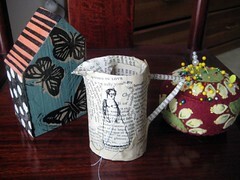 The first (from l to r) a 'house' from Cornflower Press, a papier mache stitched piece from Cathy Cullis and a pin cushion from The Daily Pincushion. I love buying art from the artists who made the art. I've loved reading all of your goals. 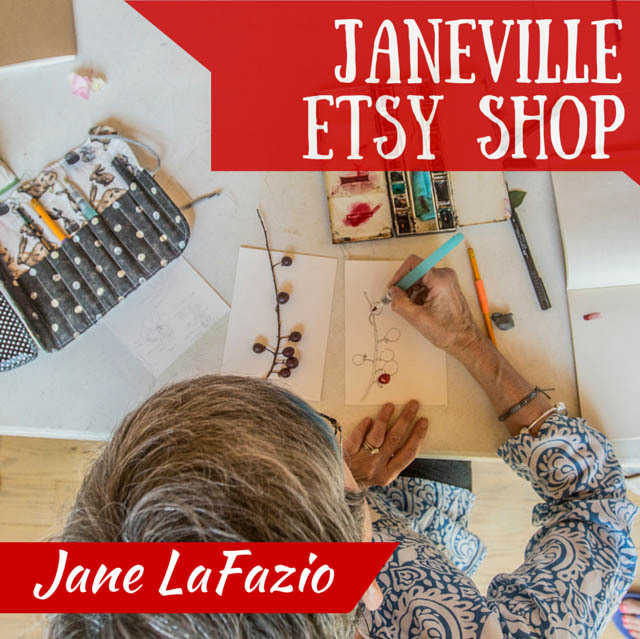 My 3 top goals are stocking my etsy shop (it's empty), updating my website and self-publishing a 'how to sketch and watercolor: journal style' to sell on etsy. AND, congratulations to VIVIKA the winner of Lyric's book! Email me with your address and I'll send you the book! 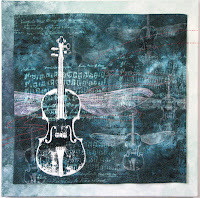 This is one of my monoprints on fabric, still in progress. See the Xs and Os? They were created using a thermofax screen from Lyric Kinard! 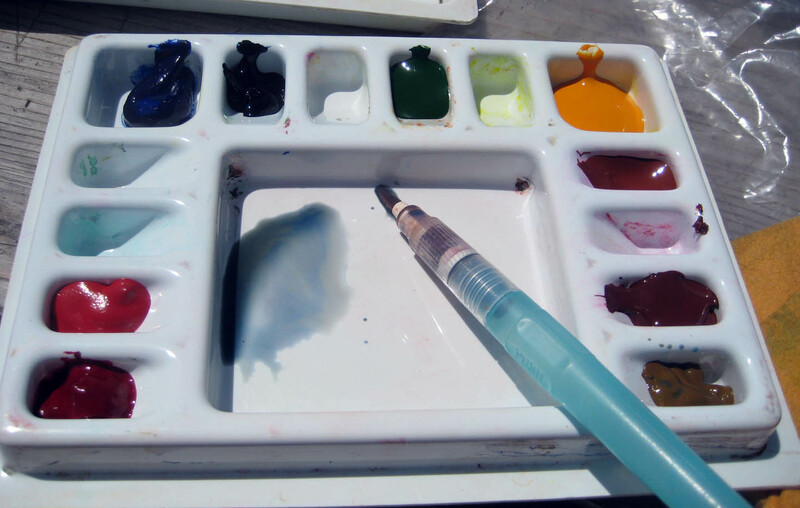 It's a screen printing screen, that you use with paint and I just use an old credit card as the squeegee. 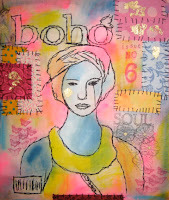 I used gold Lumiere fabric paint on this one. (and you'd laugh if you saw how many unfinished projects in my studio now have Xs and Qs printed on them! I couldn't stop!) Anyway, you can order the screens from Lyric or design your own and she'll make it for you! cool huh? And, here's an online tutorial on everything you need to know about thermofax. I found my new favorite embroidery thread. It's by the Caron Collection and I got it here online. 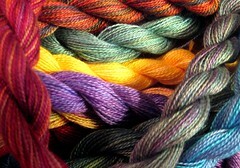 The watercolors & wildflowers, hand dyed varigated thread. Love it! 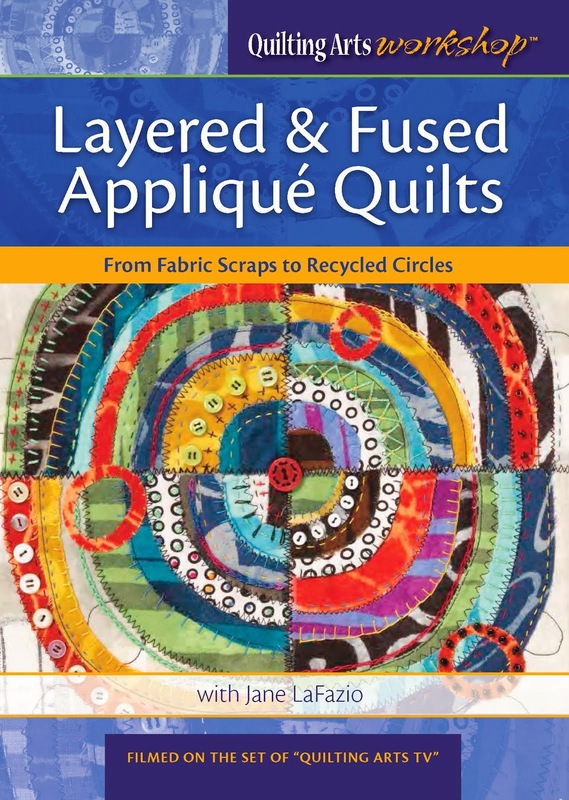 I've met Lyric once, briefly on the set of Quilting Arts TV, but I feel like I know her through her blog and DVDs. Aside from talented, she's kind, witty, and level-headed. My kind of gal. Lyric Kinard website. Lyric's blog. JL:What’s your story? How did you go from English Literature major to musician to artist? LK:Growing up I had big plans to be the first female French Horn player in the Berlin Philharmonic - no small potatoes for me! When I starte really looking into what it took to be a musician I changed my mind. The work hours were tough - days plus almost every evening and weekend. The course load in college left NO time for any other interests or part time jobs. I couldn't picture myself giving up all my other interests and being that single minded and driven in order to succeed. I ended up in English Lit. because that was the best scholarship I was offered. I was still able to spend most of my time in the music department but I did it on my own terms. I also studied and readied myself to go into graduate Architecture. I was definitely not single minded. The artist part came after I gave up pretty much everything and chose to stay home to raise my children. It took a few years but I finally found a medium that I could do in the little fits and spurts of time the mother of young children finds for herself. JL:How do you describe yourself as an artist? 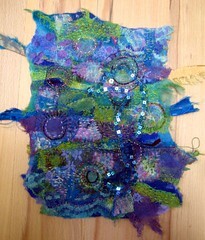 LK: I'm an artist that works with textiles as a medium. I honor the traditional quilt tradition that I come from yet feel free to leave it behind. Spontaneous and yet meticulous at the same time. Scattered in the here and now but focused on the big picture. LK: An intense need to create beauty and joy in a world where there is far too much ugliness. I suppose that puts me right out of any hope for success in the Avant Garde or high end gallery scene. Ah well. I also feel the need to create something ordered while my life is so chaotic. The chaos is all good - but it is chaos nonetheless. JL: What’s your favorite part of creating? JL: What do you listen to when you work in your studio? through for a deadline and boost my energy my playlist includes Salsa, Celtic, Bluegrass/Newgrass, Classical, Swing, A-Capella - anything unplugged and upbeat. 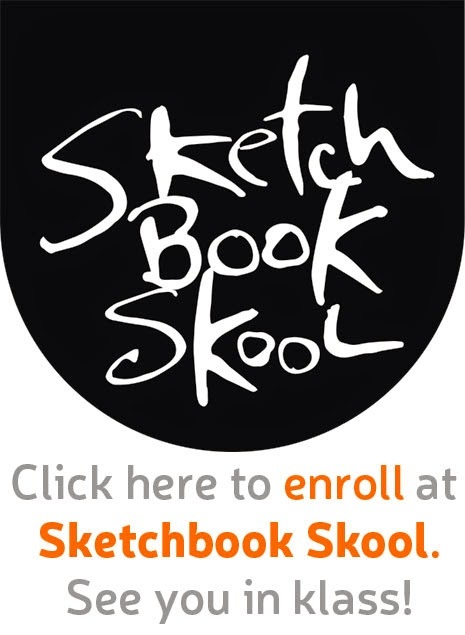 JL: Do you keep a sketchbook? What kind? LK: Yes! Always! Any kind. My favorite is a small 4x6 hardcover with a good black india ink artists pen. JL: I know you have a lot of children, (5 at last count?) yet you accomplish a great deal as a professional artist. LK: It only seems like I accomplish a great deal because you can see all the results at once. In reality - the work trickles on, I teach a few times a year, and I write now and then. All of it - in between everything I do with and for my family. L: I’ve read you often work on the go. How do you fit it in? Any tips for staying creative with such demands on your time from family? LK: Yup. Sketchbook - with you at all times. A home for your work - a place youcan leave it out so that you can come to it when you find yourself with a moment here and there. Having a "to go" project is always helpful so that you are using all of that time waiting in the carpool line or at rehearsals or soccer practice. Lyric's art materials for on the go. JL: Speaking of managing your creative time, you’ve written a book recently, Art + Quilt: Design Principles and Creativity Exercises. A very thorough, step by step on art principles. A veritable college course with so many wonderful examples. What was the process of writing the book like? Any urge to write another? like I've used up every idea in my head. But truly, it was a wondrous bit of serendipity and being prepared when opportunity totally surprised me with a rap on the door. I knew I wanted to write this book but expected it to happen much further down the road. I want to just make art for the fun of it for a while now. 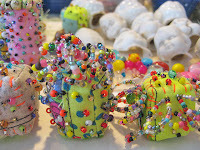 "Bead It Like You Mean It" DVD workshop. 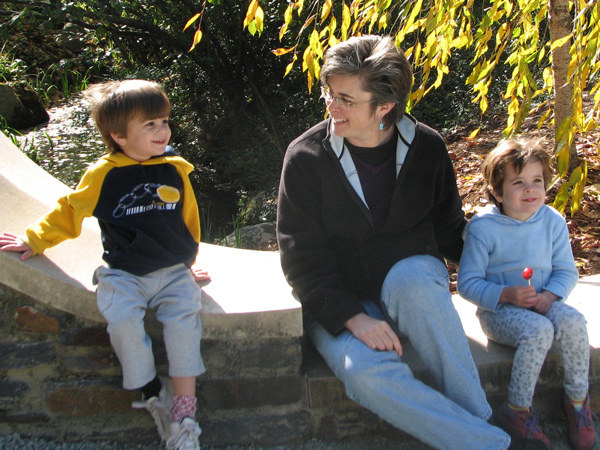 My five year goals are 1 - keep enough family time, 2 - teach for a week in Italy (I'm so excited that you get to go!) 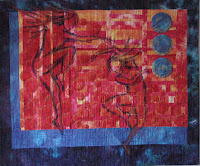 3 - make two major (large) works. Simple. Doable I think. I can't remember more than three things at a time so I have to keep it short. I write them on post it notes and stick them in a few different places to remind me. So many other opportunities come up that might be good but don't take me towards my goals that I have to be careful. It's a great problem to have. JL: Lyric, I think you’re a fabulous teacher! I’ve seen you on Quilting Arts TV and of course I have your DVD Surface Design Sampler Platter and you are so clear, soprepared, so thorough. 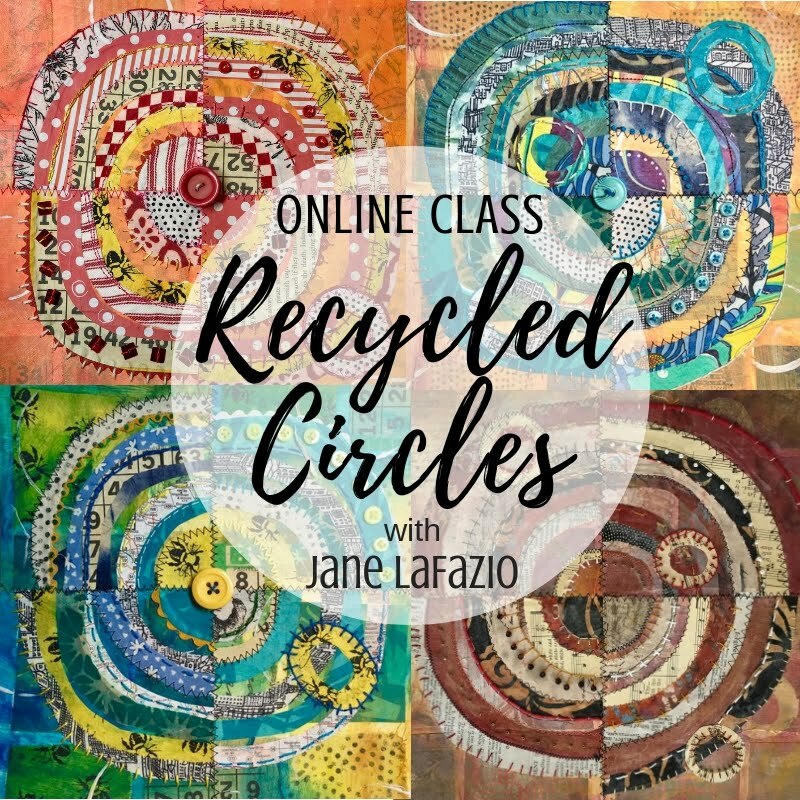 I’m looking forward to taking one of your classes in person, especially since you’ve written you play music and have the student practice yoga during your classes. Tell us about your approach to teaching and what you enjoy about it. LK: I only play music during longer five day classes - and then only for specific exercises. I can't help but break out singing corny broadway tunes every once in a while though. The yoga is the best - chair yoga. When we get intense about our hand work too often we are hunched up and tight and I simply can't keep going without doing some simple stretches. I love being with students. I love to see them play freely and to experiment and learn and grow. There is nothing better for me than to see someone overcome feelings of fear or inadequacy and accept and acknowledge and begin to nurture the creativity they already possess. I work like a dog ahead of time (I like to bring almost all of the supplies for the students so they don't have to worry about hard to find things and bringing the "wrong" stuff) so that we can relax and enjoy ourselves during class. 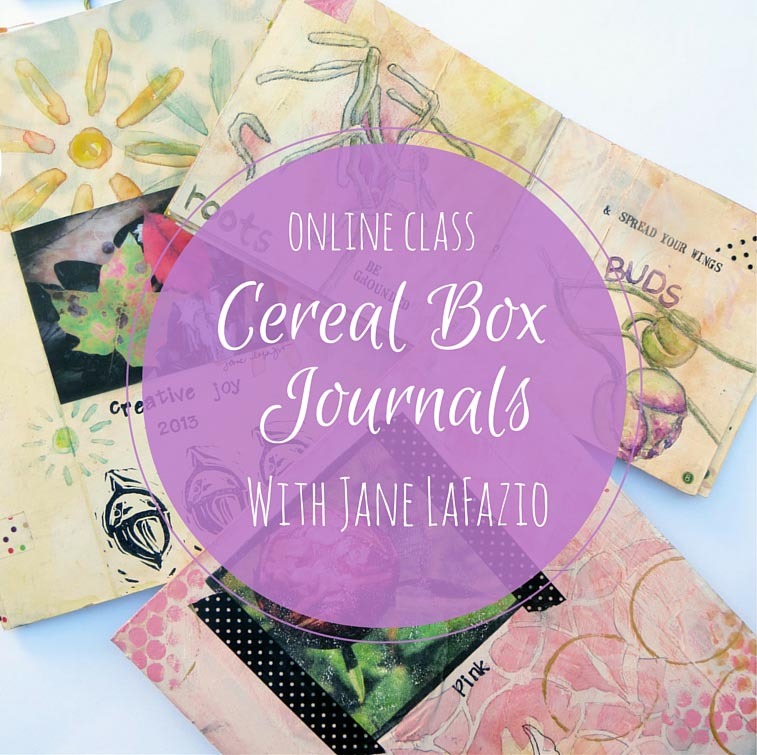 JL: What are you upcoming classes and workshops? LK: The rest of this year is actually pretty light for my teaching schedule As much as I love teaching I enjoy stretches at home in the studio and with the family. I'll be teaching mostly in the NC/VA region in August and September. 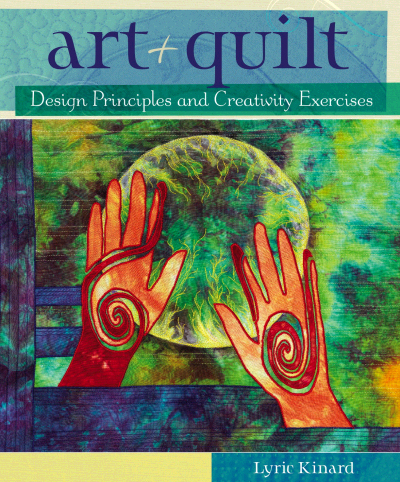 I'll give you a copy of Lyric's fabulous book Art + Quilt: Design Principles and Creativity Exercises, if you leave a comment telling me what your three goals are for this next year. 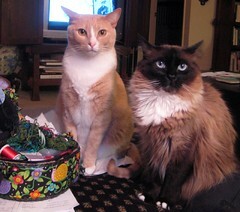 (Even if you're just thinking of them right now :-) I'll chose the winner, randomly, on Sunday, May 16. Be sure and check back to see if you're the winner! Can you see the seahorse? My mom always like seahorses. I remember the first time I saw one in an aquarium, I was amazed at how tiny and delicate they were. The sequins are square, from here. 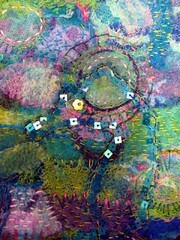 This was made of bits of needle-felt pieces, pieced and re-needle-felted, then hand stitched. Here are all the blue squares stitched and sewn together. Here's a detail shot.This piece needs a name...Any suggestions? See this gorgeous house, the Log Palace? 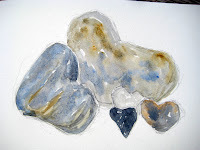 I'll be teaching a Mixed Media retreat here (without the snow!!) in July. It's limited to 8 people, so you'll get lots of one-on-one and as long as I know it, and we have the materials, I'll teach it to you. We'll be creating Fused Collages, and that incorporates many mixed media techniques. You'll get home-cooked meals, we'll go to town for a cooking lesson, visit an organic farm. All kinds of creative fun. You can see the details of the weekend here and for registration go here. By now you know that I like to cut up stuff and reasemble it. 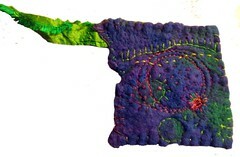 Shown, is a 3inch square, cut from this experiement in wet felting. I cut the whole thing up, did a little needle felting, and now I'm sewing it back together with no clue where it's headed. 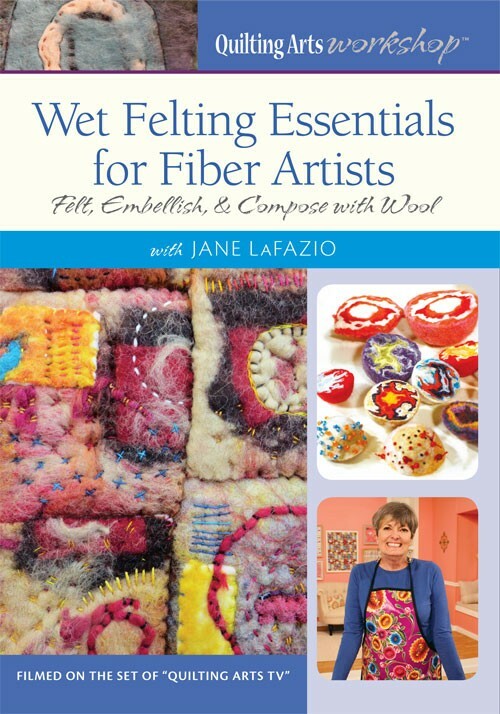 I'm teaching wet felting (and in the afternoon we'll embellish and or cut them up) in Idyllwild on Tuesday, July 6. Some women are coming for the class, and then going to spend the next few days making felt on their own. good idea huh? 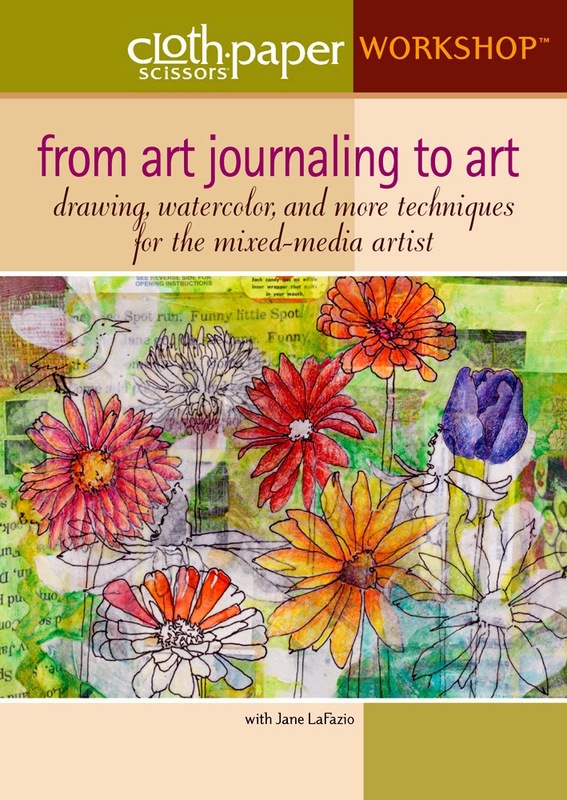 Better yet, take my Mixed Media with Paper and Cloth on July 4 & 5 and get 3 full days of creative and fun instruction from moi! Idyllwild has lots of cute hotels and many many cabins you can rent. 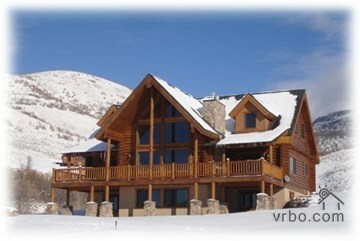 and of course, then there's Utah Retreat also in July...I'll tell you more about that tomorrow. 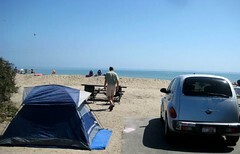 Our campsite at Doheny State Beach. that's husb walking to the picnic table. 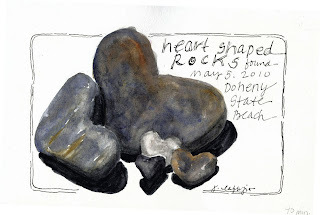 My friend Linda has a huge collection of heart shaped rocks, that I covet. This trip to the beach, we did pretty well. It's a knack, I guess. I created a tutorial on how to do this, that I'll post later. 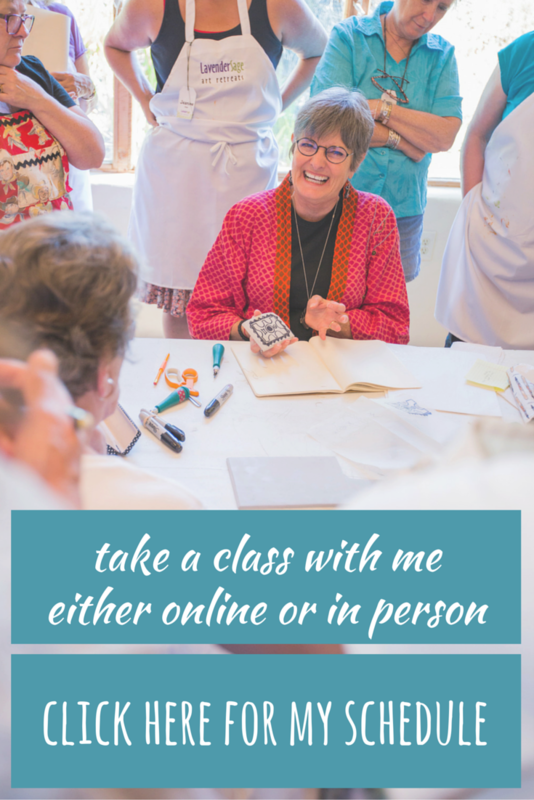 Of course, I can teach you in person if you come to one of my workshops. 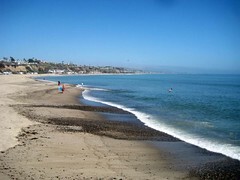 Home from 2 nights camping at Doheny State Beach right on the beach.... photos soon. All last week, I was working my Mexican theme with the Tree of Life. 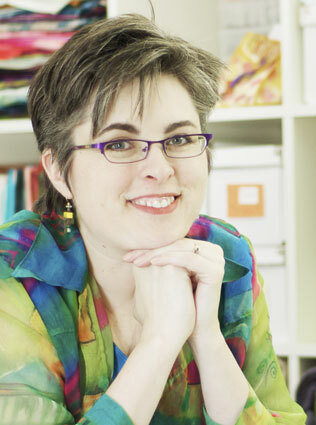 The timing was perfect, when Quilting Arts contacted me for this interview. 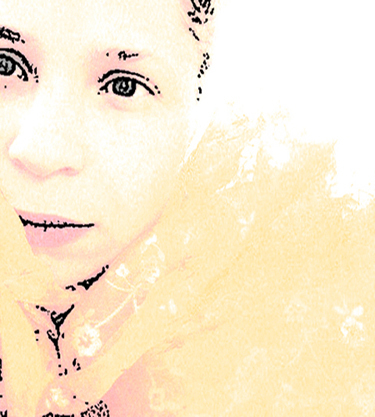 Then I was influenced by Alisa and Alma to create this flower series. 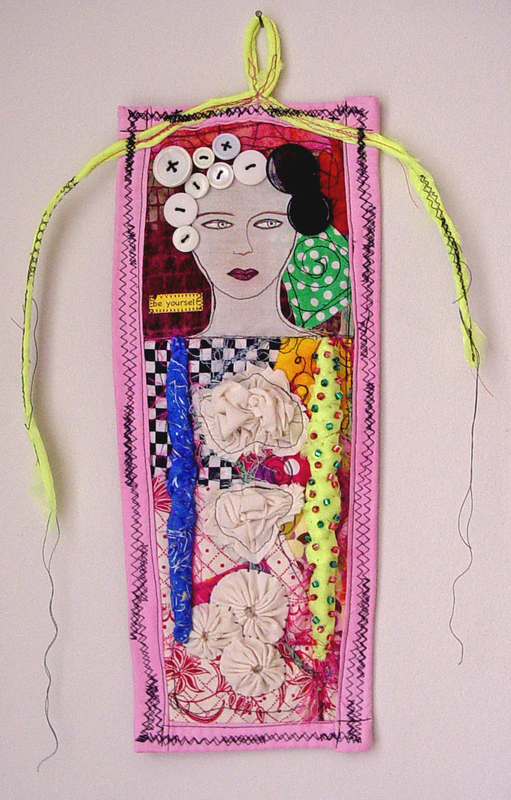 I worked like a demon yesterday creating this piece, stitching, cutting, stitching. (It's 7x21") Like I had to get it out of my system! It was great freeing fun and you can see the details here and here.I really feel that I'm finally getting the hang of free motion stitching, at least the way I want to do it. Everyone was right, it takes lots of practice. My friend Melly introduced me to Alma Stoller. Alma's work is fresh and original and I decided to interview her. JL: What is your story, how did you become an artist? AS: I have always been an artist, first in theater and music and now in all forms of art and design. 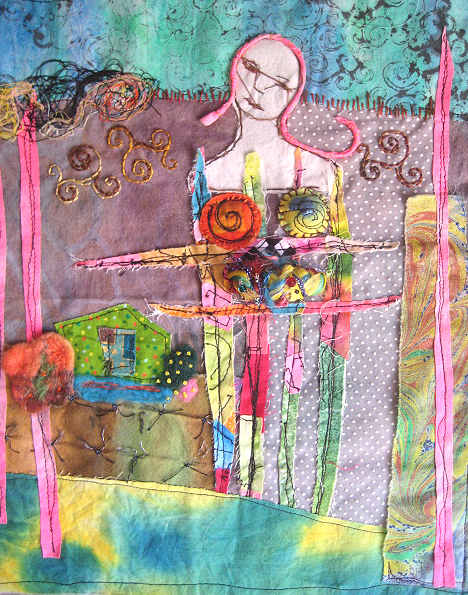 I enjoy throwing myself into it all....from painting, collage, poetry, textile art, pottery and jewelry. JL: Do you keep a journal? AS: Yes, I do....I keep an idea journal. Where I paste images that inspire me, colors that I'd like to explore and designs I'd like to explore. JL: You live in Manhattan. How long? How does it affect the art you make? Are the nearby museums a big influence? AS: Yes, I live in New York City , born and raised. I LOVE New York for the culture and the access to pretty much everything and YES, I try to soak in as much of the museums and the art life as I can. I recently saw the Tim Burton exhibit at The MOMA. It was absolutely fantastic. Sometime this week I will be making it to the new Picasso exhibit at The Met. I am sure that on some level, it all influences me and takes shape in the work I do. JL: I see you draw, paint, polymer, carve, sew, make dolls, and bead-- what is the common denominator that attracts you to all of them? AS: That is a good question. I think I simply like to challenge myself. I am not all that aware that I do so many different things....to me it is all part of the same thing....the same creative process. I feel I have something to say, something to explore, something to push me to a different creative level, so it takes shape in a variety of things. I enjoy the process of design....I like coming up with my own. I enjoy the process of figuring out the HOW-TO of this or that. 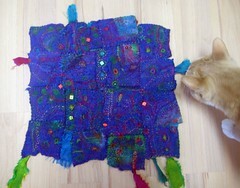 JL: I also noticed, in your most recent zine, that you love doing 3 dimensional work with fabric. How did that come about? 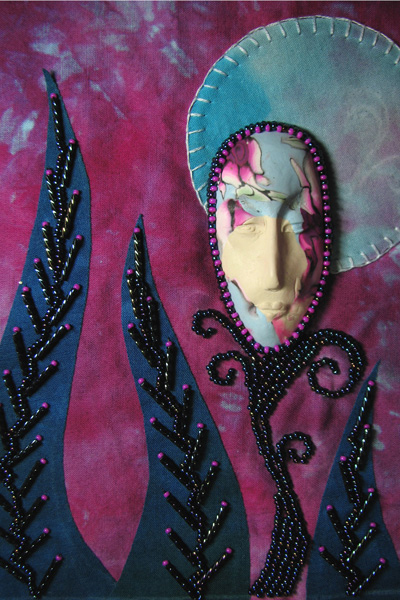 AS: Yes, Fabric Sculptures and Archi-textures.... is another way of working with fabric...playing with it to create free form pieces that ultimately shape themselves.I enjoy pottery and ceramic work, so I decided to explore those structures in fabric. JL: You love doing portraits! Why? 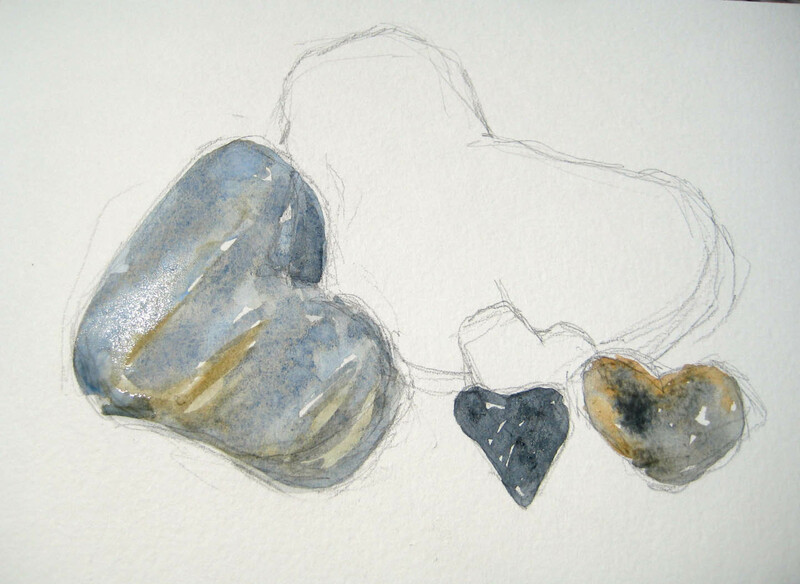 Does each one portray a mood or a feeling, or is it more the process? I love my portraits, I love the girls I create. They all have their own personality, and a story that can be read in their expression. JL: You’ve got young children. Do you make art with them? How does their artwork influence yours? 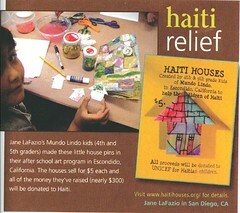 AS: Yes, my son Julian (8) knows how to embroider and he is very interested in drawing. My daughter Rose (12) is interested in fashion and design.Julian likes to create air-dry clay and polymer creations. He is a pretty adventurous artist. JL: What are your major influences in the art you make? 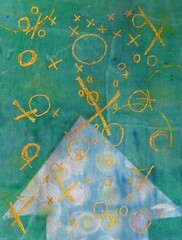 AS: Right now, I am really enjoying the works of Friedensreich Hundertwasser and Robert Rauschenberg. But like my work, my interests and influences seems to change with the season. JL: You’ve started The Glossy Project this year, tell us about it. 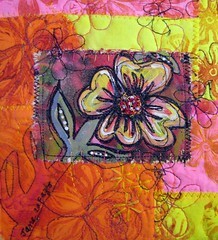 AS: Yes, The Glossy Project started out because I would get a lot of questions regarding my art quilts and designs. So I decided to create a project that incorporates what I do in a very easy way. 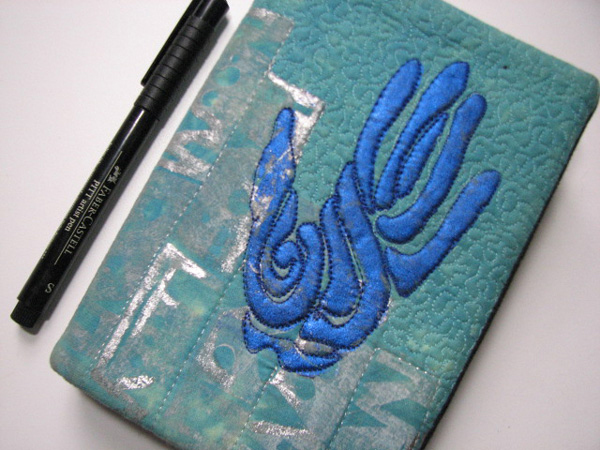 My Glossy pieces are embroidered on fabric, then they are painted, stitched, basically completely altered and jazzed up to your liking. By using images from magazines, anyone....all over the world can learn and explore it. JL: Zines. I know what they are, but I’m pretty clueless about how they work. What’s up with zines? How did you start making them, how often, how do you select the theme. Tell us about the process. 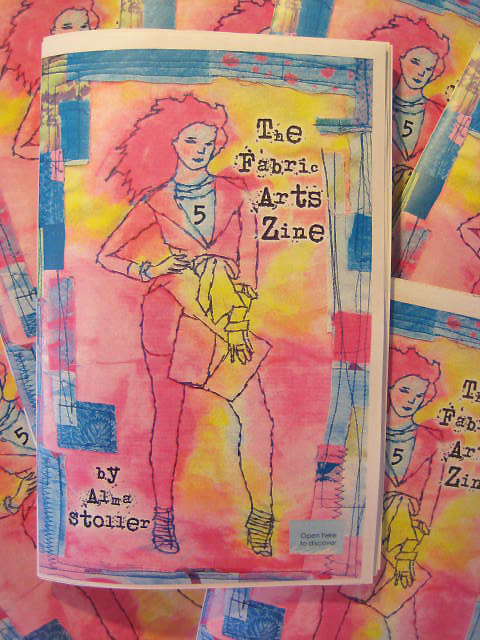 AS: Simply put, zines are self-published magazines. I recently finished issue no. 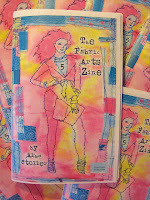 5 of The Fabric Arts Zine. It is a limited edition zine.The process incorporates writing...lots of writing, photography, creating projects, patterns and more. JL: What are you working on right now? Any upcoming projects, classes, books? AS: I am always working on something.... 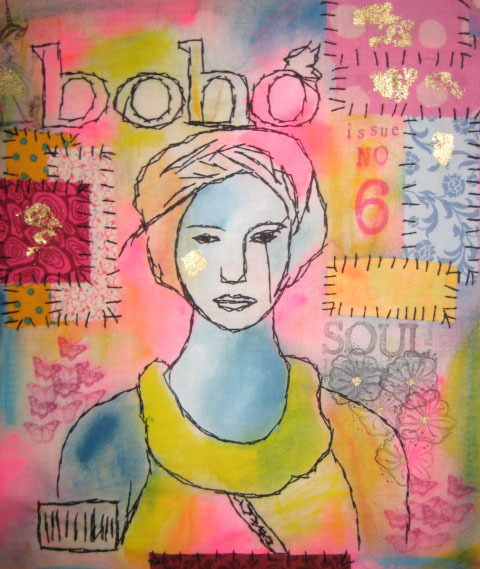 I am working on a book, another limited edition art zine and a few fabric art pieces. It really isn’t work for me. It is more like meditation....my time to zone -out and recapture myself. Remember when I stamped Alma's fabric with my stamps here. and then when I painted like Alisa here. 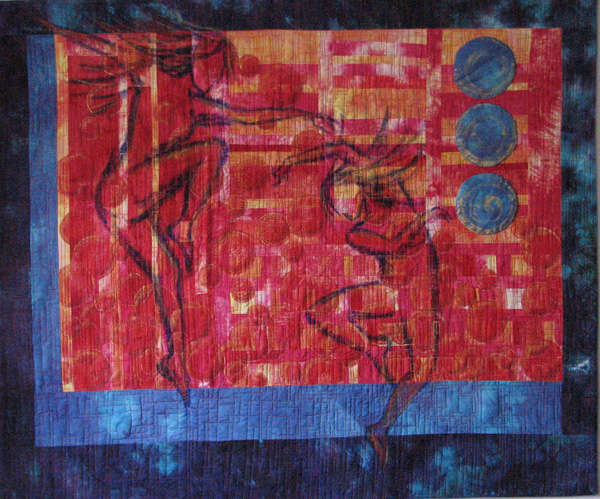 Well, I machine free-motioned the fabric, cut it up, reassembled it, free motioned, tore up the painting and put it on the 9" quilt and then free motioned some more and this is what you get. Wacky, huh? Sometimes, ya just make stuff.